The late John Lennon probably characterized his friend and band mate George Harrison best in 1968 when he told a journalist that, while George himself was no mystery, the mystery inside George was immense. "It's watching him uncover it all little by little that's so damn interesting," Lennon remarked. 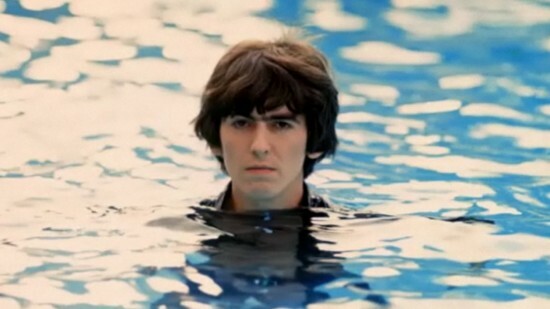 You get some sense of that slow peeling away of paradoxical mystery while watching Martin Scorsese's two-part HBO documentary, George Harrison Living in the Material World, which examines Harrison's life both as one of The Beatles and his search for spiritual solace in the aftermath of Beatlemania. Scorsese has described his film, in fact, as an exploration into Harrison's endless quest for serenity. "We don't know," he said while making the picture. "We're just feeling our way through." That unfortunately is also a pretty accurate assessment of the movie. 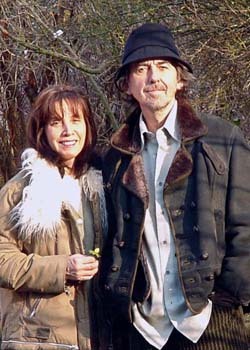 George Harrison Living in the Material World is filled with fleeting bits of revelation and insight but it seldom finds its focus. At times, the jagged storytelling and impressionistic glimpses seem arbitrary and puzzling rather than revealing. You may be inside the immense mystery that makes up George Harrison, but Scorsese can't seem to tell us why we're there. Part of the paradox of George Harrison is contained within the very character of the pop group itself. If The Beatles created a utopian culture based on the properties of inclusion and pleasure, Harrison always seemed solitary and detached. He was often called "The Quiet Beatle" but that was never quite the right assignation. He was actually moody without being sullen, thoughtful without becoming withholding, and funny without being grandstanding. His early songs also gave you clues to his relatively sequestered personality. 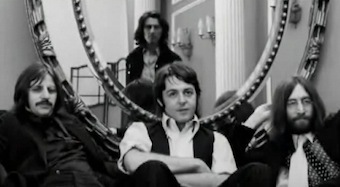 If Lennon and McCartney composed "Please Please Me," "I Want to Hold Your Hand," "If I Fell," "Any Time at All," and "Eight Days a Week," which all demanded our participation in those intensely romantic sentiments, Harrison's few songs had titles like "Don't Bother Me," "You Like Me Too Much," "If I Needed Someone" and "Think For Yourself," which set him apart from the ideals of being part of a group. If Harrison shared in the early mania of the Beatle fervor, he quickly lost the desire to continue sharing in it before anyone else in the group. He was essentially a private man caught up in a very public dream which contained elements of both euphoria and violence. If Lennon and McCartney (and to a lesser extent Ringo) would happily ride it out by continually pushing forward into that wave of hysteria, Harrison stepped back protectively. Even before the violence unleashed in 1966, when John Lennon declared that The Beatles were more popular than Jesus, George Harrison was refusing ticker-tape parades and public parties. In later years, he would even speak caustically of those caught up in the excitement. "They gave their money and they gave their screams, but The Beatles kind of gave their nervous systems, which is a much more different thing to give," he said in The Beatles Anthology documentary. 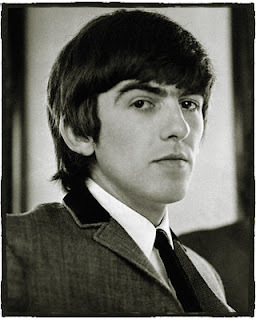 In part one of George Harrison Living in the Material World, Scorsese doesn't develop any of these fascinating themes. What we get instead is actually confusing. For instance, we start hearing Harrison's philosophical song "All Things Must Pass," which expresses both his spiritual views and his thoughts about the demise of The Beatles, before we have any idea of what exactly is passing (besides WW II images of the German blitz over England). Scorsese then contrasts the group's rise in Hamburg with scenes of Harrison signing his separation papers from the band in 1974. Perhaps Scorsese felt that The Beatles' story is so familiar to audiences that he needed to tell it differently, but his choices are more scattershot rather than bringing a needed clarity. If we didn't already know how the group evolved, we'd be utterly lost with the insertion of material on Stuart Sutcliffe (their reluctant original bass player who desired to be a painter) and Pete Best (their first drummer). Scorsese never latches on to the complications and contradictions inherent in Harrison's evolution as part of The Beatles, which should be the very essence of what his film is supposed to be about. At times, we appear to be randomly leafing through Harrison's personal scrapbook. Scorsese does however bring us some compelling moments in the interviews. 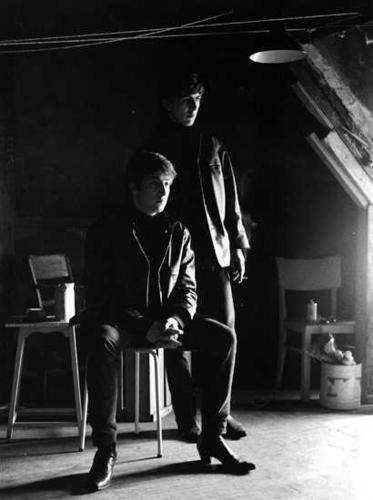 For instance, Astrid Kirchherr (who The Beatles met in Hamburg in the late fifties where she photographed them while simultaneously falling in love with Stuart Sutcliffe) tells a riveting story of how, after Sutcliffe died of a brain hemorrhage, his best friend, John Lennon, wished to visit the room where he painted. While sitting in a chair and feeling emotionally destroyed by his grief for his lost friend, Astrid asked Harrison to stand behind him to give him comfort. She describes accurately how in her photo you can see Harrison's protective support for Lennon who is seen dissolving in tears. The picture speaks to both the powerful bond of friendship within the group and the depth of Harrison's compassion (despite his teenage years). Comments by Ringo Starr, Paul McCartney and Eric Clapton (Harrison's closest friend and benign adversary) gives us some dimension to the riddles in Harrison's life despite the confusing rush of images (which are made up of unseen material and Harrison interviews conducted for The Beatles Anthology). 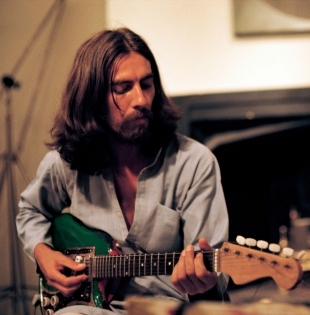 Despite his hermetic stance, it was George Harrison who developed a spiritualist world view through his embracing of ancient Hindu teachings.While his eyes first opened to mysticism through the use of LSD, he soon abandoned the drug for meditation. His music became enveloped by the beautifully melodic trance of Indian scales heard best in "Love You To" (on Revolver), "Within You, Without You" (on Sgt. Pepper) and "The Inner Light" (the B-side of the "Lady Madonna" single heard on the Past Masters CD). His devouring of the Bhagavad Gita would eventually lead him to India to study with sitar master Ravi Shankar and later to the Transcendental Meditation of the Maharishi Yogi (where The Beatles would join him). 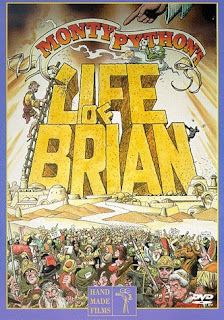 The movie does make clear that Harrison's staunch individuality came from a deeply personal need to connect to spiritual forces larger than himself, but it also led Harrison into a solitary religious piety (which the documentary barely explores). While part two, which looks at Harrison's life after The Beatles, finds a surer footing than part one, it never delves too deeply into Harrison's sharply contrasting characteristics. Wouldn't an obvious question arise as to how such a selfless spiritualist, who rejects the trappings of the material world, nevertheless lives in an opulent estate and becomes a gardener? Scorsese instead bounces from highlight to highlight only briefly touching on Harrison's infidelities and asceticism (which would end his marriage to Patti Boyd and lead to her linking up with Eric Clapton), plus his cocaine problems. George Harrison Living in the Material World doesn't satisfactorily explore the schisms that can erupt in an artist who is as much pulled into the material world as he is trying to transcend it. While George Harrison's musical output was dim following his epic All Things Must Pass in 1971, he hooked up with Jeff Lynne in the late eighties to make the Cloud Nine album a huge hit. 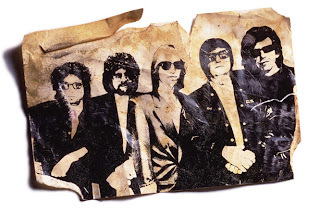 This led to a brief forming of the Traveling Wilburys (including Bob Dylan, Tom Petty, Lynne and Roy Orbison). Orbison's sudden death ended the group after their second album. All in all, Scorsese doesn't make much of Harrison's solo output (despite his declaration of love for Harrison's music). There is nothing, for example, about how Jeff Lynne helped Harrison revive his recording career and Scorsese completely ignores Cloud Nine. But Scorsese does provide some fascinating glimpses into Harrison's family life. One of the strongest appearances in the picture belongs to Harrison's wife, Olivia, whose emotionally steady and thoughtful recollections literally anchor the movie. I've always found it peculiar (but not entirely surprising) that although everyone remembers John Lennon's murder, most people have forgotten the brutal attempted murder of George Harrison in 1999. Olivia's horrific account of the evening a man broke into their home and tried to stab her husband to death is as powerful, disturbing (and moving) a moment I've seen in any film this year. She tells the story by reliving its horrors while simultaneously flinching at what those memories stir up in her. What that moment reveals, in the context of the entire movie, is how both John Lennon and George Harrison (those two contrasting figures in Astrid's photo in Hamburg) became the true embodiment of the utopian aspirations of The Beatles and their fans. They became different kinds of spiritual lightning rods (the secular Lennon and the religious Harrison) for what critic Mikal Gilmore called "a model of community for youth culture and popular music." But they also became reluctant avatars for the darker shadows of that desire for community. "[T]his longing for community - the dream of self-willed equity and harmony in a world where familiar notions of family and accord were breaking down - would haunt rock's most meaningful moments in the 1960s," Gilmore went on to write. Martin Scorsese was making the George Harrison documentary while simultaneously dipping down the blind alleys of Shutter Island. But rather than providing a stronger more coherent theme here, Living in the Material World becomes an enigma onto itself. It's an affectionate and occasionally moving examination of a reluctant star made by a director whose presence appears to be as reluctant as his subject. 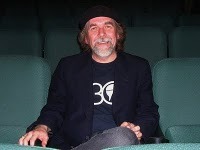 – Kevin Courrier is a writer/broadcaster, film critic, teacher and author. His book on The Beatles, Artificial Paradise: The Dark Side of The Beatles' Utopian Dream (Greenwood - Praeger), was published in 2009. His forthcoming book is Reflections in the Hall of Mirrors: American Movies and the Politics of Idealism. On November 6th, CBC Radio's Inside the Music presents the documentary Dream Times: The Story of Perth County Conspiracy...Does Not Exist, written and hosted by Kevin Courrier with sound design and production by John Corcelli. It has been a while since I've seen this film but Kevin Courrier has pretty much summarised my feelings about it.